£30 off usual Costco price which was already as cheap as anything I could find online (even bigger savings on the red model). I picked up one of these great machines from the Chingford branch yesterday. Loads of red and black in stock - couldn't find any almond though. I was surprised to find the machine also came with a "Flexi beater" (sells for £20 - £30) but some of the boxes didn't have this so double check if you pick one up. Models with the additional beater have a picture of it stuck on the side of the box. Also Costco's great return policy. Good write up online and a Which? best buy. No-one pays RRP: £260 and below elsewhere. Costco membership is £30/year. So even if you didn't buy anything else all year you'd still only be paying 369.98. Plus you get the extra attachments and Costco's well recognised great returns policy. Geez, take a pill... OP says its Costco members only and there are a lot of them out there. BTW, your £260 and below list consists of ebay and a lot of no-name web shops (ebay's one for £255 is a "new-other" so not new). I'd much rather trust Costco who are excellent for returns and service!! Apologies for double post - like I said, I'm new to this! Geez, take a pill... OP says its Costco members only and there are a lot … Geez, take a pill... OP says its Costco members only and there are a lot of them out there. BTW, your £260 and below list consists of ebay and a lot of no-name web shops (ebay's one for £255 is a "new-other" so not new). I'd much rather trust Costco who are excellent for returns and service!! If I wanted to buy one today it's a good deal isn't it? Costco membership is £30/year. So even if you didn't buy anything else … Costco membership is £30/year. So even if you didn't buy anything else all year you'd still only be paying 369.98. Plus you get the extra attachments and Costco's well recognised great returns policy. The cheapest price i can find online (from a reputable dealer) for the red mixer is £269.90 from sonic direct. Add to this £17.99 (cheapest price for the flexible attachment) = £287.89. So even taking into account Costco membership, the Costco machine is the cheapest. There's also Costco's 2 year (sometimes longer) guarantee compared to the one year guarantee from the manufacturer. And Costco is a "bricks and mortar" store, so if anything did go wrong then you'd be spared the headache of return postage. I'm sorry if I seem to be going on a bit about this but as I said, my first post so perhaps I'm missing what's classified as a hot deal. 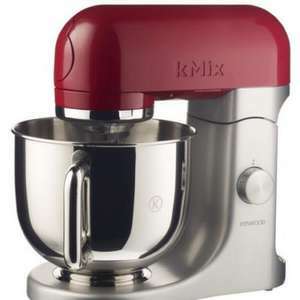 The cheapest price i can find online (from a reputable dealer) for the … The cheapest price i can find online (from a reputable dealer) for the red mixer is £269.90 from sonic direct. Add to this £17.99 (cheapest price for the flexible attachment) = £287.89. So even taking into account Costco membership, the Costco machine is the cheapest. There's also Costco's 2 year (sometimes longer) guarantee compared to the one year guarantee from the manufacturer. And Costco is a "bricks and mortar" store, so if anything did go wrong then you'd be spared the headache of return postage. I'm sorry if I seem to be going on a bit about this but as I said, my first post so perhaps I'm missing what's classified as a hot deal. Very few people will spend almost £300 on a food processor and as a result, given that CostCo is not in every town, it won't be a hot deal. Hmm, I'm still not sure I get it. Comparing like for like it's a good deal, regardless of whether most people buy it. I mean, there's a hot deal on a car at the moment; I'm sure not everyone rating it hot would be prepared to actually buy one. It seems I should perhaps go back to lurking on this site. Hmm, I'm still not sure I get it. Comparing like for like it's a good … Hmm, I'm still not sure I get it. Comparing like for like it's a good deal, regardless of whether most people buy it. I mean, there's a hot deal on a car at the moment; I'm sure not everyone rating it hot would be prepared to actually buy one. It seems I should perhaps go back to lurking on this site. Isn't the point of a deals website to objectively evaluate good deals in comparison to other prices for the same item? Rather than people voting hot or cold on the basis of their subjective opinion of the product? If I was interested in buying a car (or indeed a food mixer) today, the "hot" deals would be the ones offering the best value for money at that time. Granted it is helpful to state how prices have fluctuated over time - indicating that there maybe a better deal in future. Thus allowing the potential customer to decide whether he should wait for prices to possibly fall again, or settle for the best price available today. It's not purely based on price sensitivities. I voted cold as it's CostCo and has v high price and you attempted to make it better than it is by stating it's RRP. I am entitled to vote on my opinion just like you or anyone else is. You are quite right of course. I feel I have nothing to contribute to a forum where other members are labelled as immature and "deluded"
It's not purely based on price sensitivities. I voted cold as it's CostCo … It's not purely based on price sensitivities. I voted cold as it's CostCo and has v high price and you attempted to make it better than it is by stating it's RRP. I am entitled to vote on my opinion just like you or anyone else is. I stated the RRP as I thought this fact would be helpful. It is immediately followed by "£30 off usual Costco price which was already as cheap as anything I could find online". The usual Costco price would therefore be £269.98. The cheapest online price as established earlier is £269.90 from Sonic Direct (although without the extended warranty and additional accessory). This is 8p cheaper the the usual "expensive" Costco price. This is actually a good deal at this present moment - yes it might come down in price over the next year .. but it might not! Ignore them Drew, these are the people that only get excited when pancake … Ignore them Drew, these are the people that only get excited when pancake mix is 17p. I have been looking at food processors/mixers and although I eventually settled on a Kenwood Chef Titanium (a lot more than this one - so people do spend a fortune on a mixer, but hey, I don't drink, don't smoke but love to cook and bake!) This is actually a good deal at this present moment - yes it might come down in price over the next year .. but it might not! It's not worth £269, accessories or not. I've just called Costco Chester, and they've advised it's £278 ish including VAT. Boooooo. GibsonSt19. Hopefully this link will work. Page 5 of the current coupon book. As far as I know it's nationwide. Thanks drew78, quite why the store didn't tell me it was currently on offer, I have no idea. Must have too much business coming in. If I had £240 and a non-expired Costco membership then I'd be snapping one of these up as part of my 'red kitchen appliance' fetish, but sadly not. But I agree that this is a good price for what it is - perhaps not scorching (under £200 would get me excited) but probably the best price at the moment. Don't be put off posting - Costco deals usually bomb, as do deals for things that are seen to be expensive in the first place. Very rarely see a deal for a top-end kitchen appliance go hot, so this is nothing unusual. That doesn't mean that it won't help anyone else who is in the market for one! If I had £240 and a non-expired Costco membership then I'd be snapping … If I had £240 and a non-expired Costco membership then I'd be snapping one of these up as part of my 'red kitchen appliance' fetish, but sadly not. But I agree that this is a good price for what it is - perhaps not scorching (under £200 would get me excited) but probably the best price at the moment.Don't be put off posting - Costco deals usually bomb, as do deals for things that are seen to be expensive in the first place. Very rarely see a deal for a top-end kitchen appliance go hot, so this is nothing unusual. That doesn't mean that it won't help anyone else who is in the market for one! I take your point panddda. I really don't care at all if it's voted hot or cold as long as it helps someone interested in buying. Must admit I was quite shocked at the initial response I had (especially as my first post). Like we both agree, this is a good price at the moment. Believe me I did loads of research - and I'm full aware it may fall in price. Grabbed one yesterday. Thanks drew78. Heat added. Deal posting newbie! This is drew78 first deal post. Help out by leaving a posting tip or just to show your appreciation for their contribution.